Let's jump right in and review the current state of our webtask. Let's look at a simple diagram to illustrate this concept. Previously, we worked exclusively with the Webtask.io Editor. For this example, let's work with the CLI. If you do not have it installed and configured currently, you can find instructions here. It takes about a minute. Gists are an easy way to host middleware via a URL. The downside is that every time you update a gist the URL changes. 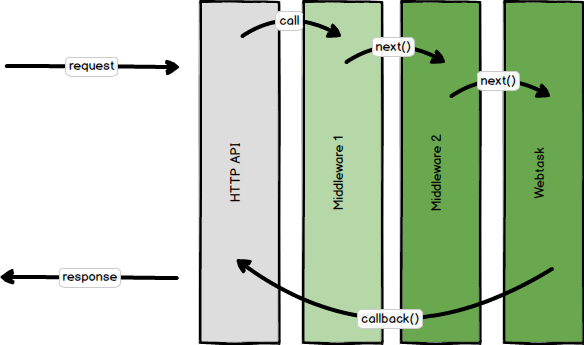 So, let's use a simple trick and set up a webtask to host our middleware. We want our webtask to return this exact code. So, let's wrap it in a template literal and assign it to a constant. Next, let's create a webtask export that returns the template literal to all requests. Now, let's create a simple webtask that uses the middleware url as middleware. Let's inspect the webtask and take a look at all the things specifying middleware has set up for us. 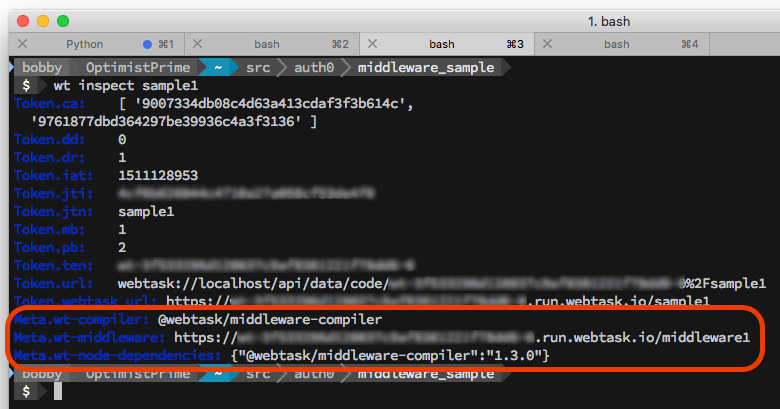 You can inspect your webtask using the following command. 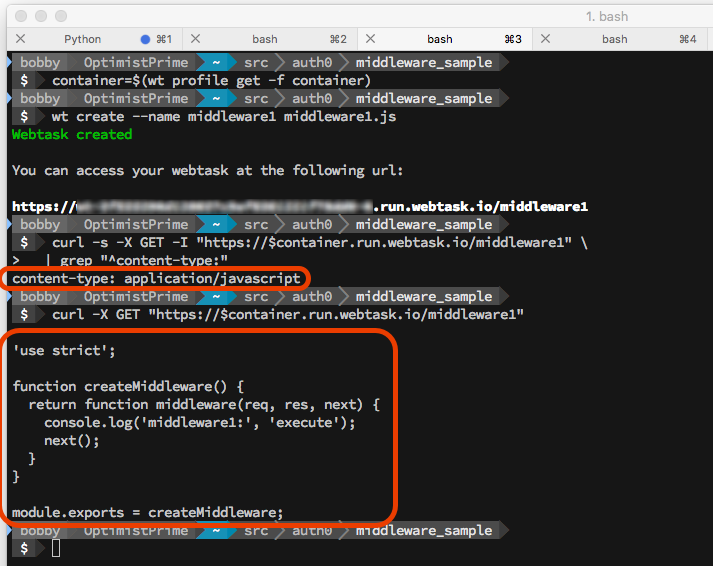 Let's duplicate our middleware URL and create a new webtask that is configured to consume both middlewares. 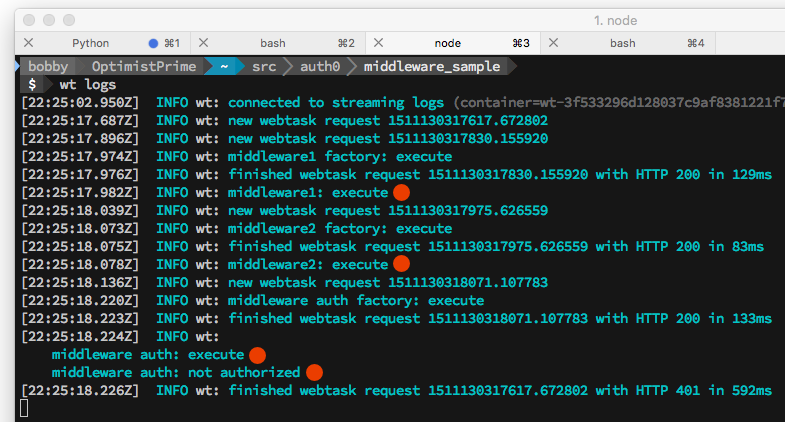 Let's connect to the real-time logs using the CLI and execute the webtask. Let's wrap this middleware up in a factory and publish it as webtask. Note that in this create command we are passing all three middlewares and setting our auth-secret value to 'open-sesame'. Let's test our new secure webtask. One final note, don't worry about writing your own bearer authorization middleware. We already did it for you and published it to NPM. So, let's step back and consider where we are now. We have made significant progress securing our webtask. We have moved our shared secret authorization to middleware that can be easily shared with other webtasks. We have also stopped sending the authorization key as a query string value; handing over as a bearer auth token instead.